I’ve been a licensed Ham since 1985, having first been licensed in Louisiana and spending most of my adulthood in Austin, TX. Now I find myself Sonoma, CA in the heart of California’s wine country. I hold an Advanced class license and do intend to take that last test for Extra some day. I currently serve as Vice President of the Valley of the Moon Amateur Radio Club. In years past I served several different positions with the University of Texas Amateur Radio Club. 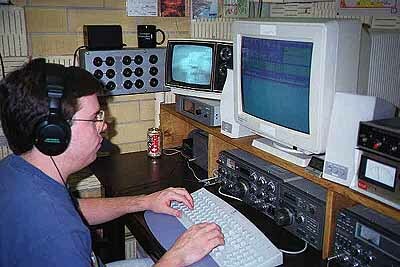 Operating the University of Texas Amateur Radio back in the day. CRT Monitors and black and white TVs.